My husband said this is not a door mouse but a door rat! This pattern is from a Machine Knitting News Supplement. 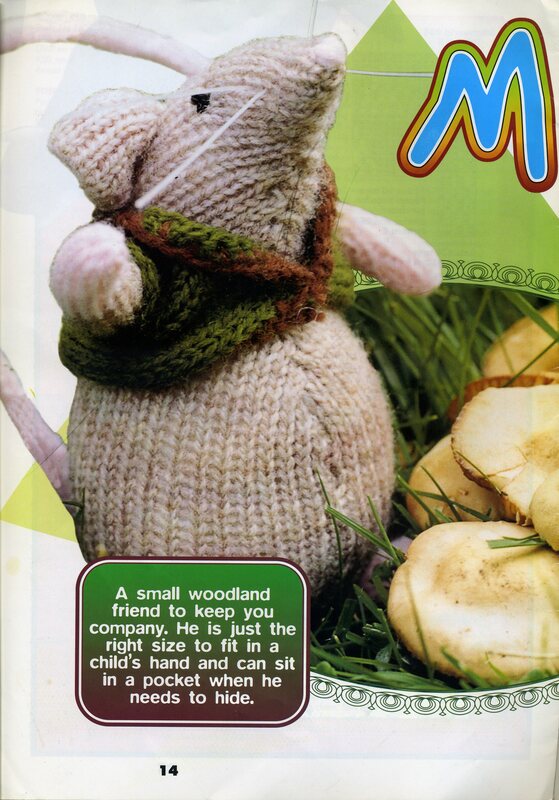 It is knitted and not felted in the supplement. I did not like the seam down the front of him and I love felting so I decided to see what would happen if I felted him. I just used a size 8 tension. 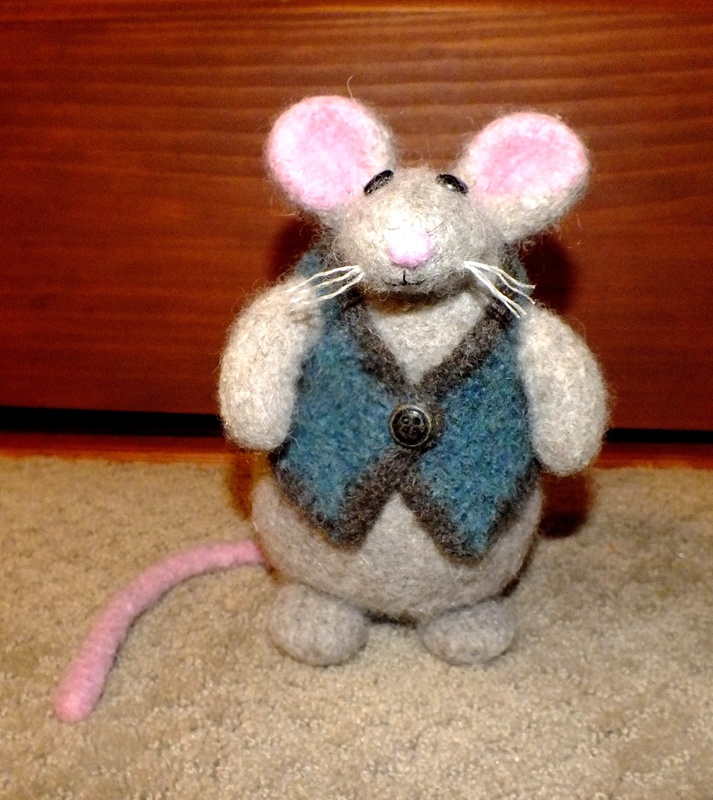 I attached everything before felting including his little vest. As you can see, my vest does not look like the pattern. Everything was going well until I started to knit the vest. It did not make sense but I knitted it and it was wrong. So I did it how I thought it should be and ended up with the correct amount of rows and stitches. 100% of the time I think I am wrong but I don’t thinks so in this case. Anyway, I like how the little vest turned out. I crocheted around the vest and then I sewed the middle up the front. It did not felt small enough so I cut it up the middle and sewed a button on. So…………….now I will go back to the passap and try another technique. He is pretty cunning…or fetching as I would say. Go get that Passap ! It has nothing on you ! Thanks so much for sharing..he looks great!! Love everything about him,including his vest! Is it possible to allow me to have a copy of his pattern? Since that magazine is out of print?Would appreciate it!! May have that particular issue,but,having just moved to where I am now,and having my does kdding – haven’t unpacked any of my wonderful English MKing mags yet! My daughter in Hi. got married last September to a wonderful man from Holland,who lives on Hi.They plan to move to the states,probably next Summer.She has been “playing” with the Brother 359..we plan to do some things together,long distance,tomorrow. So enjoy your posts..hope you have had a special holiday so far! Cannot believe it will be 2014 next week!! Just how did I get to be in my 70’s?? Well,better get back outside and check on my girls! Have a Happy New Year..and,again,thanks for your sharing your MKing adventures! !Look forward to your p osts!! Sandy in sunny,wonderful Colorado.Do you have much snow?Understand your weather has not been very nice lately!! How well I remember the “concrete” snow,living south of Cleveland !! Date: Mon, 30 Dec 2013 00:57:28 +0000To: windspiritranch@live.comFrom: comment-reply@wordpress.comSubject: [New post] My Door Mouse�.. Rat? Hi, good to hear from you. Will send tomorrow since my computer is shut down for the night. That is just darling. You did an excellent job.